Santa Clara, CA – April 8, 2009 – Milestone Internet Marketing, Inc. announced today that www.nylohotels.com website won the Best Hotel and Lodging Website Award in the recently concluded Internet Advertising Competition Awards (www.iacaward.org). The website won the award for greatness in appeal, richness of content, and search engine optimization, which drives website traffic and online revenue. The websites were judged using six criteria including creativity, innovation, campaign impact, design, copywriting, and use of internet medium. The awards are produced by the Web Marketing Association (WMA). The judges for the awards are experienced professionals with an in-depth understanding of the current state-of-the-art in advertising design and represent some of the best the Internet Advertising community has to offer. The NYLO hotels website was a result of extensive collaboration between NYLO hotels and Milestone’s award winning design and promotion teams. “The website marries NYLO’s unique positioning, hotel design concepts, and consumer appeal with Milestone’s design excellence and search engine marketing strategies, said Patrick O’ Neil, NYLO’s Executive Vice President of Operations. 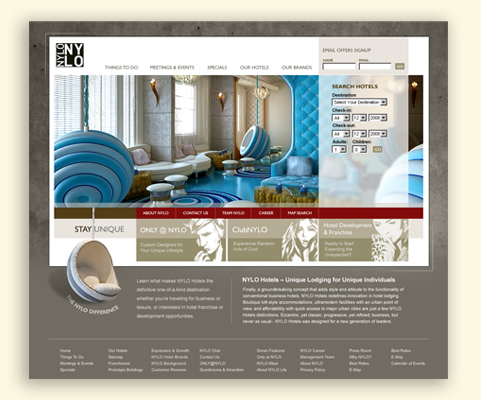 He added, “NYLO’s modern and chic hotels with contemporary elegance appeal to the hip modern consumer . We needed a website design and online marketing company that would highlight our market positioning and develop a comprehensive online marketing plan that would put us in front of the online consumers. Milestone did a phenomenal job of achieving our goals.” The masterpiece website was an outcome of several months of collaboration between the two teams and is developed on Milestone’s award winning GalexiTM Content Management System. The results from the website even in the three months it has been live have been spectacular. The visitor traffic to the website has jumped 59% since the website went live. The page views have increased nearly 9X since the website went live 3 months ago, clearly illustrating that consumers are attracted to NYLO’s unique market positioning and find the website interesting. Most significantly, the online reservations from the website is up 35% year-over-year for the same three month period. This is impressive given the current economic conditions and decline in consumer spending on hotel rooms industry wide. Milestone Internet Marketing, Inc. is a leading provider of Internet marketing solutions for the lodging industry. Milestone’s portfolio of services included Website Design, Search Engine Optimization, Pay-per-Click marketing, Email marketing, and several Social Media Optimization initiatives like Online Videos, Blogs, RSS, etc. 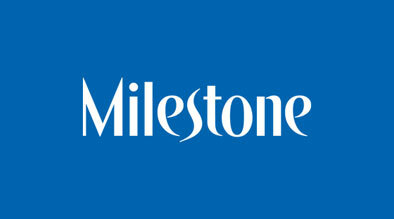 Milestone currently works with over 700 hotels and drives over $150M in annual revenue for its clients. Milestone is a preferred vendor for several major lodging industry brands and works with some of the leading management companies in the US. Milestone is also well known as a lodging industry educator for its Hotels to HTMLs internet marketing workshops and book. For more information on our products and services, please visit www.milestoneinternet.com or email [email protected] or call (888) 350-8396. To become a buddy and stay current with the latest tech trends, click here. I couldn\\\’t expect nothing less from Nylon hotel and Milestone! The website totally deserved the award, that\\\’s beyond question for sure. I personally prefer full flash websites but this one really caught my eye..